Apple has a new employee challenge kicking off this month, this one focused on mindfulness and meditation. Apple is said to have partnered with the app 10% Happier [Direct Link] for the challenge, tasking employees to meditate for a specific amount of time per day for 25 days (via MacGeneration). While the challenge is focused on 10% Happier, employees can also use any mindfulness app that ties into Apple's Health app on iOS. One of the areas that Health measures is mindfulness, showing you how many "Mindful Minutes" you've accumulated over the past day, week, month, and year. This information can be filled by mindfulness apps like Headspace, Aura, Calm, 10% Happier, and Apple's own Breathe app for Apple Watch. 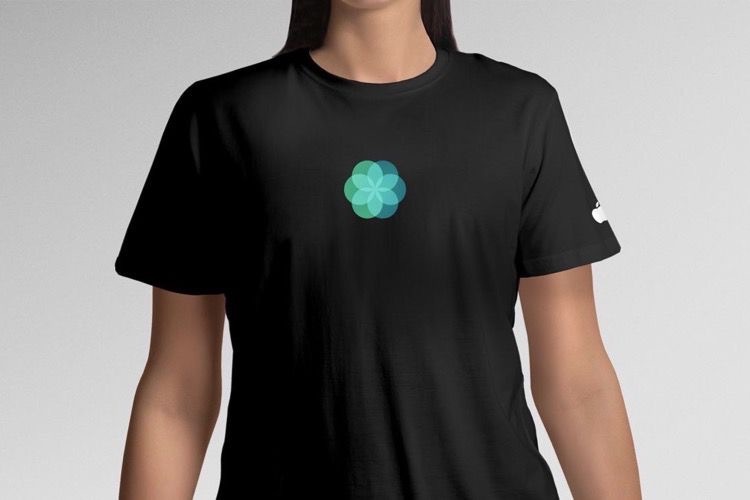 Employees who complete the challenge will be awarded with a T-shirt that displays the Breathe app's blue and green logo. Apple has held similar internal challenges for its employees in the past, although they have mostly focused on physical exercise of some kind. In April 2017, employees who completed the stand, movement, and exercise rings on the Apple Watch each day for a month received an Activity rings pin in gold, silver, or bronze, based on how many days in the month they achieved 100% ring completion. Another competition like this was held earlier this year, but the prize was an exclusive Apple Watch band. You need an app to tell you to breathe? I'm hoping this is a joke. It guides you through deep breathing. That's not the same as normal breathing. Lots of hard research showing many benefits of mindfulness meditation. People like to make fun of the Breathe app, but if it can actually prompt people to be more mindful that’s a good thing. True story. I suffer from generalized anxiety disorder and when I feel an attack coming on, my go to is the breathe app. Unfortunately it doesn't work every time, but it can more often than not. I don’t disagree necessarily with Mindfulness but since this program is an Apple Employee program and since the general public can’t buy whatever items Apple uses to encourage participation in the program I don’t see a lot of value in reporting this. Mindfulness meditation often works by focusing on the breath. The app isn’t to help you breathe, it’s to help you practice mindfulness. I wish Apple would sell T-Shirts like Tesla and Space X do. Don't they already sell them in their Infinite Loop and Apple Park stores? Put them online! I meditated once and now I can see the future and have telepathy. Gotta say, as a total skeptic, I’ve been converted to a mindfulness meditator, although just a novice still, and the 10% Happier app has been my introduction. I surprised myself because I’m the last person you’d think would buy in to mediation at all. What appeals to me is that it strips away spiritualism and focuses on practical brain science. Turns out, patience, kindness, and even happiness are skills, not just “the way you are,” that can be developed with exercise. Since that turns out to be true, why not work on that? People don’t scoff at gym workouts, and the interpersonal and even longevity benefits of mindfulness training look like they’re greater. The whole approach is that you can’t screw up meditating. We’re imperfect; if our mind wanders, as it will, just begin again. In the app, Dan Harris is an engaging host and Joseph Goldstein is just wonderful. I love even watching him in an interview. So insightful, unflappable, and even humerous. I’d love to be that serene when life’s crap gets thrown my way. I like Apple’s recent focus on health, and am happy/impressed that they’re focusing on health of the mind as well as the body. I’ve never been able to meditate and doing the breathing exercises on the Apple Watch just makes me agitated and more fidgety. My husband swears by the breathe app for helping him lower stress and keep his blood pressure in check. I envy those of you who can benefit from these things. I’m religious but even so, I can’t pray for more than a few seconds at a time. I joke that my prayers are more like Tweets to God. I’m not ADHD so far as I know. I can focus on most other kinds of tasks where I can see with my eyes something getting finished. Edit to add I guess I did okay with the breathing App on the Fitbit. I still don’t think I got out of it what people are supposed to get out of it, but at least I could look at the sparkles on it and not get so twitchy. You sound like just the kind of person mindfulness mediation could benefit. I suggest you give one of those apps a shot. You can’t fail. Does spending time in prayer count?